August 18th, 2010 is a day that a lot of people won’t forget; two amazing people got married, 150 people enjoyed a beautiful outdoor wedding and I got to tick off one of the most talked about items from my list- Number 27- Minister a Wedding! This time last year I became an ordained wedding minister via an online application form. My goal was to be a wedding minister and once I received my credentials, the universe began to work it’s magic. I heard news shortly after that 2 friends of mine living in San Diego, Peter and Osamu, had just got engaged, and so after a brief conversation, I was booked for my first job as a wedding minister. All I had to do was write a sermon and not be late! Peter and Osamu met 6 years ago working at Starbucks, and since then have become best of friends. 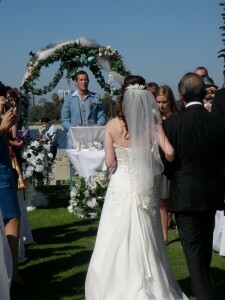 Truly lovely people, it was an absolute pleasure to be able to be part of such a great occasion. To both of you; thank you! Armed with my trusty retro blue leisure suit and a sermon that Peter insisted I make light-hearted and funny, I arrived in town 2 days ago both nervous and excited. Coronado is one the of most quaint and perfect places I’ve seen. A little island based just off San Diego, Peter has been brought up here and like everyone else here it seems, he is a fine sailor and a member of Coronado Yacht Club. 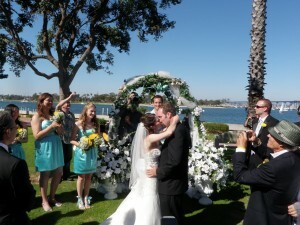 It only made sense then to have the ceremony on the shores of San Diego Bay with the yacht club in view behind us. 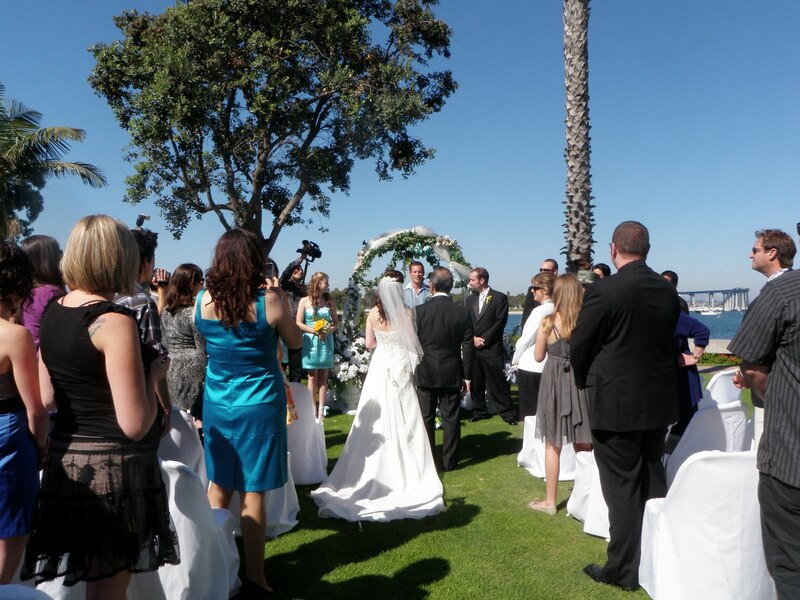 Osamu looked beautiful as her father walked her up the grass isle, and supported by 3 groomsmen, Peter and I waited at the alter with huge smiles beaming. It took roughly 20 minutes to get through the sermon and amongst a collection of jokes aimed at Peter’s unique hobby of collecting lizards, snakes and tarantulas, we somehow got to the end and successfully married the two together. 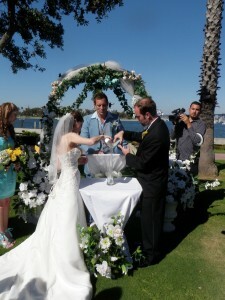 A Sand Ceremony was a highlight of the ceremony where Peter and Osamu poured individual jars of sand into a communal vase, hence symbolizing the uniting of two people as one. Of course, I had to learn what this was as when Peter initially mentioned that he wanted to complete a Sand Ceremony, I reacted by saying that I would love to have the ceremony on the beach! The reception afterwards kicked on into the night and the video of this awesome day will be available soon. But for now, congratulations to the newly weds and also thank you! What a day!